I realize it’s been quite some time since I’ve written on this blog, but I feel as if I have a pretty decent excuse. Actually, I had a couple. I was going to claim that I was affected by the government shut down, but my wife didn’t think that was very appropriate. In hindsight I’d have to agree. No, for the last few weeks I’ve been in a bit of a slump, a post Oktoberfest slump if you will, though it’s not for the reasons you’d think. Well, part of the slump is for reasons you’d think, mostly my body readjusting to a lifestyle where drinking a gallon of beer in a single sitting is no longer appropriate. But my post Munich hangover is more emotional than physical, a lingering feeling that I’d achieved something great during that incredible weekend, an achievement that I may never achieve again. For that was the weekend that in the blink of an eye, I became the UN’s Unofficial Envoy of Peace for Oktoberfest. It was day 2 of the festivities and poor weather forced us to find shelter in a local Italian restaurant that was having their own mini Oktoberfest (for those that have never been, getting into a tent is rather difficult unless you get there early, though we were fortunate enough to do so the day before). 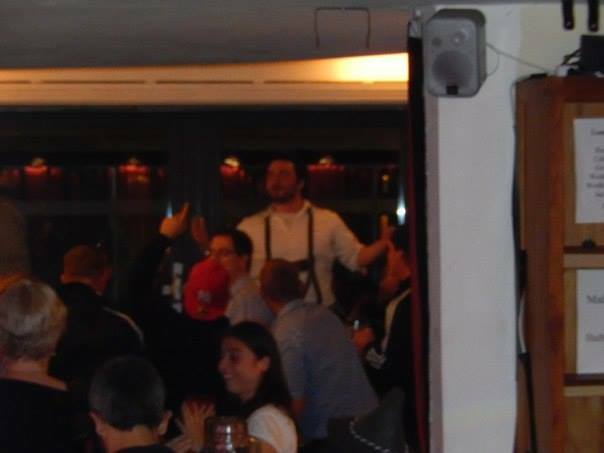 I was tipsy, but not drunk enough to be able to ignore the fact that my lederhosen was soaked through and I was quite chilled. I don’t want to say that I was grumpy, but I wasn’t exactly the most pleasant man on the planet. Fortunately for me, the restaurant was also selling liters of beer, and before I knew it my frown was upside down. After a couple liters, any signs of agitation were completely eliminated from my being and as a result, I danced. Actually, that’s an understatement; I danced hard. Despite the fact that I was wearing a moist garment made out of the finest deer skin Germany had to offer, I was in my “happiness zone” a zone that I often invite other people into though they rarely except. Anyway, after running out of breath due to my festive movements I made my way back to our table to hydrate with some beer and grab a slice or two of pizza. Unbeknownst to me, an aggressive situation was growing on the dance floor, one that in hindsight may have been the result of people no longer having a chubby American guy to laugh at. Without warning, a huge fight broke out behind us which was quite jarring to me as I’ve rarely seen people fight since I’ve been living here. This particular fight was intense, and not just because it’d been awhile since I’ve seen one. At least ten guys were involved and at one point, they’d found boards or pieces of wood to swing at each other. Worse yet, this restaurant, presumably a place of peace, didn’t have a doorman so things were only going to get worse before they got better. Seeing as I was at peak happiness, I decided I was the only person that could take control of the situation. In my mind, the situation would dissolve as soon as I stepped into the snarling cloud of masculinity, my peaceful ways flowing off me like an aura of sorts. Fortunately for me, I had a friend along that was in a more sober state than me. He wiped away the fog of delusion I was blinded by and showed me that not only would my peace not have stopped the altercation, but it may have directly contributed to me getting stabbed. I didn’t like standing idly by at first, but my blood alcohol level was quite high, which meant it may have made it difficult for paramedics to stop the bleeding should I be assaulted with a knife. So I stepped back and watched the battle continue, sad that there was nothing I could do. As I scanned the area, I discovered that the DJ had stopped the music to help control the situation. This angered the crowd, a crowd that needed some sort of outlet for the intoxicated energy that flowed through their bodies. I suddenly realized that a few people were moving towards the door, apparently bored and in need of some fisticuffs to satiate their angst. It looked as if everything came full circle and it was again up to me to prevent things from blowing up into a riot. It should be noted that I’d recently rekindled my affections for “The Touch” by Stan Bush, a confidence boosting anthem first featured in The Transformers: The Movie and that has since been remastered. In fact, I’d been using it as a mantra of sorts during moments where I was feeling anxious due to large crowds or when I had to go potty really bad. If anything, the song is about realizing that just one person can make a difference, regardless of their lack of robotic transformation abilities. I did have the touch…. I DID HAVE THE POWER!!!! And with that I moved forward, climbing atop a bench that I probably shouldn’t have been standing on but was the only thing around that could elevate me above the crowd. Like tends to happen when a man in a silly costume stands up on a stage of sorts, everyone turned towards me and so I prepared to give a speech about peace. Then I realized that I was in front of an audience who’s first language was not English. The suddenly began to chant for music and fearful they’d carry me outside and beat me with boards, I did the only thing that felt right at the moment; I sang “The Circle of Life” by Elton John, complete with the Lion King intro as seen in the movie. Now most of you have been taught that the ideas of lovable idiots tend to get them into trouble, and throughout my life this was certainly the case. However, for one reason or another my plan actually worked and the bar patrons began to gather together, exchanging peace themed gestures and singing the songs that united them all as citizens of the world. It happened quite quickly, which was good because it proves that humanity is still capable of forming bonds despite differences in culture, religion or preferred musical genres. It was also good because the large beers I’d been drinking all day had finally run their course and were waiting impatiently to be urinated out. Today is a new day and as I sit here writing, I realize that my melancholy, while understandable shouldn’t prevent me from keeping the trend of peace and love alive. There’s just no telling when a sudden explosion of violence will break out and the world will need a man fueled by 1980’s power metal to come and make things right. 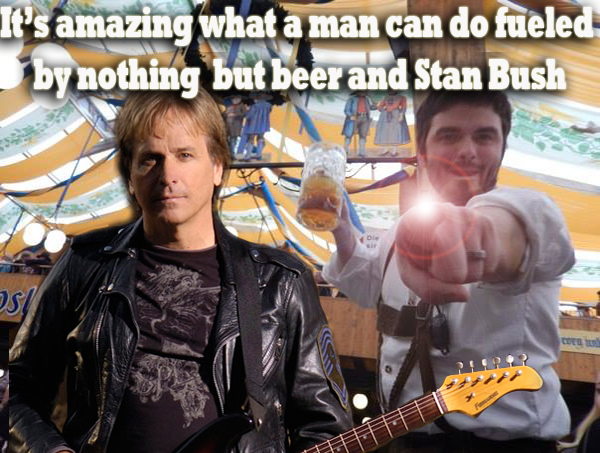 Tags: beer, ethan moses, oktoberfest, peace, stan bush, the touch, transformers, UN envoy. Bookmark the permalink. Love to hear Stan Bush’s thoughts upon reading this article!! Ethan,you may be across the ocean, in another country, yet, you still make me laugh outloud! !